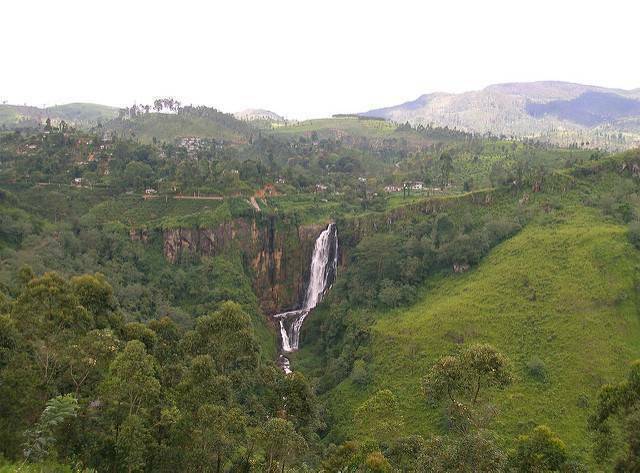 The Devon falls is cited as one of the most popular waterfalls in Sri Lanka mainly because of its clear view from the popular Hatton Nuwara Eliya Road. This fall derived its name from British planter called “Devon” who was one of the pioneers in Coffee planters in Sri Lanka. Not many people know that coffee was the first plantation introduced by the British to Sri Lanka, before the introduction of tea, but it failed miserably. Near the Devon Falls a Kovil is located for the warship of Tamil workers of tea plantations. There is also a bungalow in front of the falls which was made by the British governor in 1923. The fall can be easily viewed from the main road i.e., A7. There are two main viewpoints locate this road- one is close to Mlesna tea castle and the lower one. The lower one is significant because the two falls, Devon and St. Claire, can both be viewed together from this point. The surroundings of this fall are lush green and provides for a beautiful view. There is a lake running to the nearby hills and it looks quite magnificent. This place is also perfect for the sunset shot and gives you yet another place to get your pictured clicked. The Devon Falls is simple breath taking and you have to visit it to feel the surreal experience.